A non-profit seeking to empower Malians by translating and publishing "Where There Is No Doctor: A Village Health Care Handbook" in Bambara. A donor asked us if we could help create a Dokotoro gift card. We loved this idea and were happy to oblige. 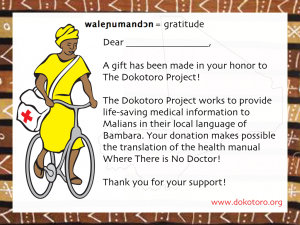 For $50, you can dedicate a page of the forthcoming Bambara-language edition of Where There Is No Doctor. Just go to our online giving page at First Giving, make a donation of any amount, and you’ll get the link to download a file that you can print out or email. If you’d like to customize it, we may be able to help. Contact lyle@dokotoro.org. We are getting closer to our goal of raising $15,000, which will give us enough to finish the book project. Please join us in making this become a reality! This entry was posted in News by Matthew Heberger. Bookmark the permalink.